– Great for networking! I can personally attest to hiring someone that I met at one of these training events and I also got a job through it. There is a session titled “How to get a job with Microsoft” do I need to say anymore? -Next time you go for a job interview and they ask “How do you keep your skills up to date” you can say you attended SQL Saturday. -Learn a new technology in a billion dollar industry which is becoming one of the hottest fields. If you are new to IT or what to get into IT this is a great opportunity to learn for free. -Get free stuff (swag, books, etc) by just attending! Yes it’s true,vendors and sponsors are there to pass free stuff. They pass out a free book every session and they run a raffle at the end of the day. I won a book and a USB flash drive with 30GB of video training ($300 value). 8:30 AM Session – If it were up to me I would attend Allan Hirt’s session on Hybrid Solutions The Future of SQL Server Disaster Recovery. It sounds like a great topic to cover and is part of the SQL 2014 track. Unfortunately, I have to present my own session during that time slot on the Fundamentals of SQL Server Backup and Recovery. I’m excited about that session because I love to give talks on the foundations/basics topics. 9:45 AM Session – I’m most interested in the session by Kerry Tyler on SSAS Tabular Model. This is an area that I have very little knowledge in and I’m trying to prepare myself to learn about more aspects of the SQL Server BI Platform. Joseph D’Antoni’s session on In-Memory Columnstore Indexes also sounds very interested; again part of the BI/DW functionality with SQL Server 2014 but on the DB Engine side of things. I might end up flipping a coin although my instinct tells me I need to learn more on SSAS for upcoming projects. 11 AM Session – The session titled Analysis Services Terms and Concepts for the DBA by Mark Valliancourt seems like a great match up with my choice for the previous session. 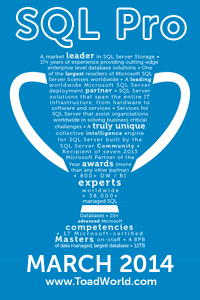 I would definitely be a great way for me to further my knowledge with SSAS. Karen Lopez’s talk on Database Design Contentious Issues also interests me greatly. I think one of the best ways to step up as a DBA/Developer is to have better design techniques. The session is also highly interactive which means I’ll be able to ask questions about issues that occur in environments I have worked in and get answers! Again, I may have to keep that coin handy… Heads or Tails? 12:00 PM Lunch! But that is not all! There are sessions being delivered at this time by many vendors as well as a special panel discussion titled: “Beyond Stereotypes: Equality, Gender Neutrality, and Valuing Team Diversity.” I have been asked to participate in this discussion (very honored to be part of this) and so I’m hoping to see many faces there so we can talk about this issue openly and find solutions to make our work environments better. Stay tuned for more details as they surface on the schedule! 4:00 PM Session – Finally as the day winds down I’m going to be attending Warner Chaves’ session about Extended Events. This is a topic I’m very interested in learning more about. I’ve known Warner since the beginning of this year and I’m looking forward to meeting him for the first time at this event and attending his session. I think that Extended Events are a very useful feature for Performance Tuning SQL Server and I was not a huge fan of Profiler so I’m looking to take my DBA skills to the next level with this introduction to an important feature in SQL Server. Actually, you won a flash drive worth $500 + $20 or so shipping to someone who didn’t attend PASS Summit, like me. You’re just lucky no one robbed you of it on your way to the car. 500 American dollars but literally priceless.